Ensign 1 is multiplayer space combat game that allows players to leave their ships on foot to commandeer turrets, and other starships. Players will also be able to purchase weapons, upgrades, and brand new ships. 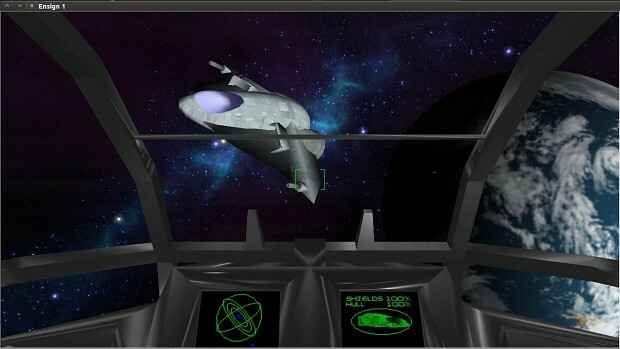 The game features hybrid style gameplay where when needed you pilot a space ship or get down to fight baddies in first person shooter style. Ensign 1 is currently on Kickstarter looking for funds and the developers need all your help. They have already raised $718 out of targeted amount of $1,000 with 5 days left. So help them bring the game to Linux. With a minimum pledge of $1, you will get their earlier game Helena The 3rd for Linux. There are all sorts of other benefits too. Check out their Kickstarter page.